Gray triggerfish are caught by both divers (7% of the fishery) and handlines (90% of the fishery) in the US Gulf of Mexico and Southeast Atlantic. In the Gulf of Mexico, the population is overfished but not experiencing overfishing, whereas the population status in the Southeast Atlantic is unknown due to a lack of data. Bycatch species include snapper and groupers, some of which are overfished species. Management is moderately effective as efforts have been made to reduce fishing pressure in the Gulf of Mexico, although the population has not recovered yet. Handlines and divers do not cause significant habitat damage. Historically, landings peaked in the Gulf of Mexico in the early 1990’s at 550,000lbs. In 2015, the Southeast Atlantic landed 328,730lbs and the Gulf of Mexico landed 47,480lbs. 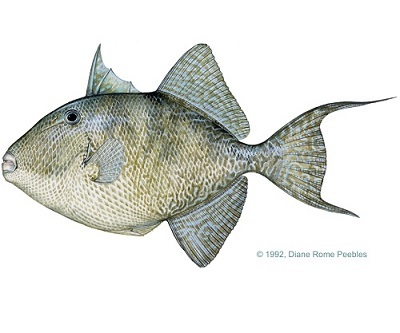 A significant recreational fishery exists for the gray triggerfish in the Gulf of Mexico. All gray triggerfish is sold within the US. Queen triggerfish are caught in Southeast Atlantic US, US Caribbean, and Puerto Rico. All product is sold locally. Queen triggerfish are caught in reefs and are considered a “near threatened”species by the International Union for the Conservation of Nature (IUCN). High amounts of bycatch are caught including threatened species such as sea turtles and Nassau grouper. There is little to no management of the fishery.